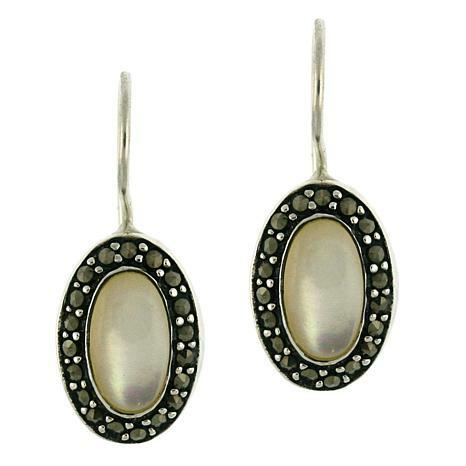 Simple yet fashionable, these Mother-of-Pearl and Marcasite Sterling Silver Drop Earrings are the stylish finale you've been looking for. An oval white mother-of-pearl cabochon (approx. 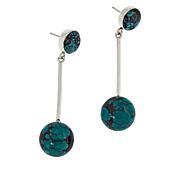 5x9mm) is bezel-set in a glittering frame of round pavé-set marcasite (approx. 1.1mm). Just the right size, just the right colors, wonderful back safety clip like none other I have ever had. These beauties go with anything from casual to work to dress up. Love them. I gave these to my Mother for Christmas and she absolutely adored them. I couldn't be with her for Christmas so I had her open her gift over the phone and she was so surprised! 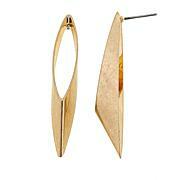 This earring is smaller but not lacking in beauty. I don't know why the reviews aren't higher. It is the best mother-of-pearl stone I've seen in a long time. Deep, deep rich glow and perfect marcasites around. They go so well with my 2 Mother-of-pearl necklaces. Substantial weight and very classy. Nice substantial ear clasp. Love it and my husband does too. Mine arrived with bent wire the part that hooks behind looped wire is mis-shapen so doesn't stay in place as it should. Wire is very thin so bending it back into position is challenging. 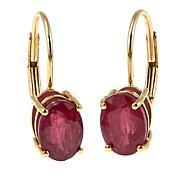 Will keep trying very gently, 'cuz I do like these earrings. MOP is beautiful. I agree they are smaller than expected. I had noted measurements first but was still surprised. However, these match the Dallas Prince oval MOP ring exactly - just a tinier version -, which was my goal. Who is this designer?